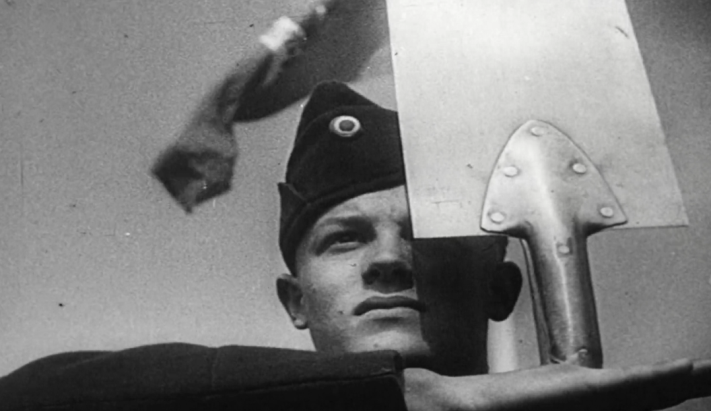 At the end of may 2018, the Netherlands Institute for Sound and Vision released its National Socialist Movement film collection. In collaboration with the Dutch Institute for War, Holocaust and Genocide Studies (NIOD), we published this controversial film collection as part of the WOII Open Data project. The collection has both a scientific and social value. By releasing the collection in the context of a thematic, national online portal, the memory of this period is kept alive and further research and large scale reuse is stimulated. The films are made available open online which creates an excellent starting point for big scale reuse by e.g. researchers. The collection was published on various websites such as in.beeldengeluid.nl, we created an online theme channel with some highlights of this film collection, we provided more information and context on our BeeldenGeluid WIKI, the films can be watched and downloaded via our open access portal Open Images and we donated the material to Wikimedia (after which reuse on Wikipedia is possible). We also published a blog in which the entire project was explained with links to all websites, as well as a vlog on Youtube. We also organised a press release/symposium at Sound and Vision on the subject and invited people from several institutions to listen to a panel discussion about the historical importance and the urgency to release this content as open data. This project took off when Network War Collections (Netwerk Oorlogsbronnen) started its WOII Open Data Depot project: they examined about 800 photos from the National Socialist Movement photo service. The National Socialist Movement service also had a film division and all these films are digitized by and stored at Sound and Vision. Because of the partnership with Network War Collections and the Dutch Institute for War, Holocaust and Genocide Studies (NIOD), we had very diverse skilled people in one project. We were also advised by an external copyright lawyer, specialized in confiscated war material. To address copyright issues, Sound and Vision uses a flowchart Intellectual Property Rights, that was presented last year by copyright lawyer Maartje Hülsenbeck at the 2017 FIAT/IFTA gathering in Mexico City. We have used this flowchart in order to determine whether the National Socialist Movement film collection could be put online. Based on the outcome, we did a risk analysis and determined that the collection was in the Public Domain and could be put online, despite the possible ethical concerns. We prepared our own organisation by drawing up a Q&A and informing the Managing Director and our communication team of possible critical questions and media attention. The release got a lot of media attention. More than 50 websites, including all kinds of Dutch newspapers and news related websites, and several Dutch newspapers published an article on the release. It was spoken about on two national radio stations and a Dutch well known talk show (PAUW). Within the WOII Open Data Depot project, all parties involved strive to make archive material available with open access. So they all share the same view that – if possible – the archives must be opened to anyone who has interest in the material for any reuse. In this project everyone is already working on making archive material available online so no extra funding was needed. From a more archivist point of view, we were interested in opening up our collection in collaboration with external partners and investigating the possibilities for the use of linked open data. Besides, this collection provides an interesting case study into copyright and ethical issues. Open reuse of collections leads to visibility of the collection and the institution. When taking the collection to places like Wikimedia, attachment with articles on Wikipedia is possible. In doing so, you will take your collection to the place where the public is, so the chance people get in contact with your collection grows enormously.